On two quarts of dandelion flowers pour one quart of boiling water, and let it stand all night; the next morning strain it, and add three pounds of sugar and one lemon; then boil for half an hour. Walsh, John Henry. The Economical Housewife. London: 1857. Gather greens and wash them. Place in a serving dish. Fry the bacon until crisp. Remove from pan, leaving about 1 tablespoon of grease in the frying pan. Beat the eggs in a small bowl. Add sugar, vinegar, and water. Beat well. Add this mixture to the frying pan, place over the heat, and cook until thickened. Pour the hot dressing immediately over the greens. Crumble the bacon over the top. Serve right away. If you don’t like dandelion greens or want to make this out of season, you can substitute a small head of lettuce. Trim away the rind from a piece of fat bacon weighing from six to eight ounces. Chop fine, put into a frying-pan and place over a moderate fire until the fat is well drawn out and has slightly changed color. To the liquid fat add one-half as much sharp vinegar, let stand for a moment then pour the mixture over the salad, which has been dusted with pepper and a little salt, and serve at once. This dressing is very suitable for dandelion or other field greens which are slightly bitter. 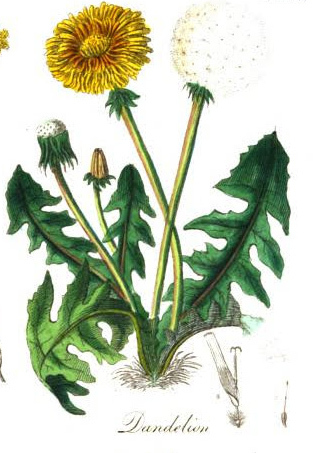 Other ways to eat dandelions were listed in an 1837 book The British Flora Medica (also source of image, above). "In spring, when the leaves are tender and nearly white, they are used as a salad in many parts of the continent, and occasionally by the poorer class in this country. In France, the blanched leaves are eaten with bread and butter. The root dried and roasted has been proposed as a substitute for coffee, for which purpose it is quite as well adapted as Succory. Murray states that a decoction of it is used by the poor of Gottingen, who find it to resemble coffee in no slight degree. The roots are also eaten raw as a salad, and are boiled by the Germans like salsafry and scorzonera. The leaves and stem, but particularly the root, abound in a milky juice, which is inodorous and slightly bitter, accompanied with a sweetish saline taste. It reddens the vegetable blues according to Hermbstadt, by the tartaric acid it contains." "People who, under the old order of Maine Prohibition, never dreamed of keeping a drop in the house, have read so much about the after-July drought that they have dragged out and dusted off all the old family recipes, and now everybody is well heeled with dandelion wine or blackberry brandy or elderberry wine or apple-lightning or some potent home-made beverage that is sufficiently powerful to remove varnish from the walls. The Prohibitionists are going to have a lot to answer for when the citizens of Maine and the other states of this great nation settle down to the steady consumption of home-made grog."